NETWORK FINALS: CBS’s AFC CHAMPIONSHIP game adjusted to 15.4, and HUNTED went up to 4.1 with West Coast numbers added. On FOX, the 7PM SON OF ZORN rerun lost 0.1, as did ABC’s AMERICA’S FUNNIEST HOMEVIDEOS rerun. CABLE HIGHLIGHTS: TNT’s THE LIBRARIANS was the leading scripted cable show on Sunday, up 0.09 to 0.50. On Showtime, HOMELAND jumped 0.15 to 0.46 from the season premiere that had been previously available via VOD/streaming, and THE AFFAIR ticked up to 0.18. On E!, MARIAH’S WORLD dropped 0.06 to 0.25, and THE ROYALS was up 0.02 to 0.23. HBO’s THE YOUNG POPE fell 0.13 from last Sunday to 0.17, although that was down a smaller 0.02 from last Monday’s episode. Adult Swim’s SUPERMANSION slipped 0.02 to 0.42. 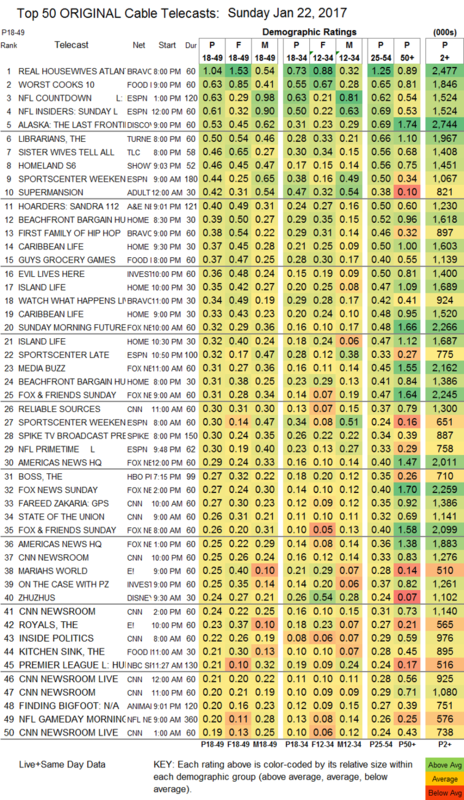 Sunday cable was led by its unscripted programming, with Bravo’s REAL HOUSEWIVES OF ATLANTA up 0.04 to 1.04, its lead-out FIRST FAMILY OF HIP-HOP up 0.02 to 0.38. Food Network’s WORST COOKS IN AMERICA had a 0.15 bump to 0.63, and GUY’S GROCERY GAMES was up 0.08 to 0.37. Discovery’s ALASKA: THE LAST FRONTIER gained 0.02 to 0.53. 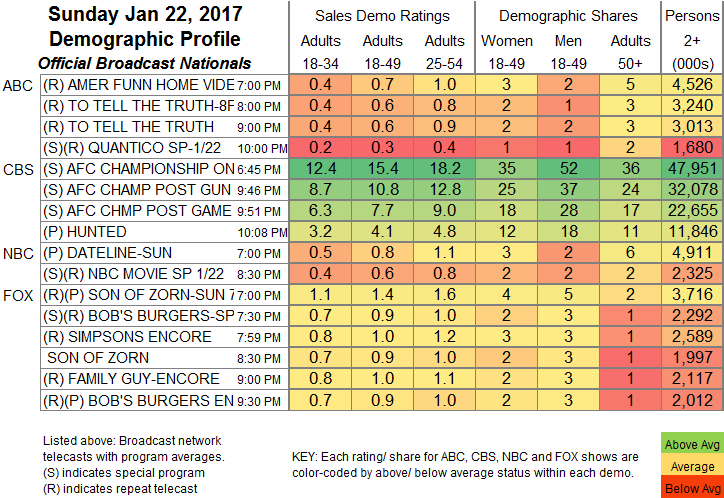 On TLC, SISTER WIVES TELL ALL dropped 0.08 to 0.46, and LONG LOST FAMILY was down 0.04 to 0.14, with MARRIED BY MOM & DAD down 0.03 to 0.11. A&E’s HOARDERS leaped 0.14 to 0.40. ID’s EVIL LIVES HERE was at 0.36.